Here is our nod to the laid back surfer style of the sixties that originated right here in So. Cal. Our Huntington surf style sunglasses encompass the unexpected trends that arose from that iconic era and wrap them up in a fashionable, beautiful and stylish pair of shades. To Tower, it was important to maintain the integrity of of the Southern California natives and salute them with a "thank you" for being the first ones to carve the waves, set the path and create a binding beach lifestyle community. On Point Fashion: Handmade Black Walnut frames hand sanded and polished with a beautiful wax finish. Flotation: Yes, a dry pair floats! Finest Polarized Lenses: Polaroid Ultrasight, scratch-resistant lenses with UV 400 protection. 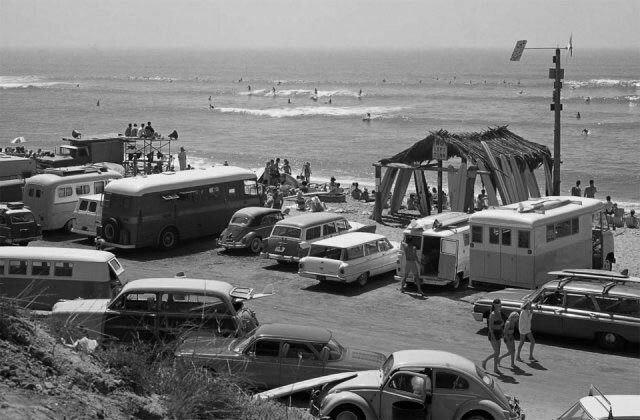 This is our tribute to the surfer style of the sixties that originated right here in SoCal. Our Huntington surf style sunglasses encompass the unexpected trends inspired from that iconic era and wrap them up in a stylish pair of shades. To Tower, it's important to maintain the integrity of the Southern California style and beach lifestyle community. Handmade Black Walnut frames hand sanded and polished with a beautiful wax finish. Yes, a dry pair floats! Polaroid Ultrasight, scratch-resistant lenses with UV 400 protection. While it is called "Black Walnut," it is actually a dark brown colored wood with a typically straight grain. Historically used for things like gunstocks, furniture, flooring and paddles, it naturally darkens over time and thus ages beautifully. Black Walnut is native to North America, and historically in Europe, it has been considered a symbol of fertility. Made by the company that invented the polarized lens, Polaroid Ultrasight lenses are the best lenses on the market. They employ nine functional layers to make an amazing lens. An internal polarizing core that eliminates glare is sandwiched by 4 UV filters that block all harmful UVA, UVB, and UVC light rays. A shock absorbing layer for impact resistance encases this core, followed by an outer top and bottom scratch resistant layer for optimal durability. Early surfboards in Hawaii, the birthplace of surfing, were carved out of local trees like Koa wood. Wood is not only beautiful, it floats. In the 1950s and 60s, Surf style sunglasses were all the rage in Southern California and surfing was taking off. Surfboards were made of balsa wood at that time, but would soon transition to foam and fiberglass construction. All of these new fiberglass boards would use wood stringers for rigidity (most still do today), and many had carved blocks of layered wood on the nose and tail. As fins came the scene, they too were made of wood at first. Wood craftsmanship and surfing went hand in hand. To this day in our San Diego based surf factory, our shapers still play around making fiberglass encased wood fins, wood nose and tail blocks, and even entire balsa wood surfboards. It's in their blood. It's in the roots of the sport they love. Unmistakably, there is a nostalgic connection between handcrafted wood work and surfers, and really all watermen. Tower's handcrafted wood sunglasses are a nod to this rich tradition. Dubbed "Surf City" and immortalized in the 1963 #1 radio hit "Surf City, USA" by Jan and Dean, Huntington Beach is an integral part of surfing history in California and the world. The pier was first surfed in 1914 by George Freeth, the Hawaiian born "Father of modern surfing." Southwest of Los Angeles 35 miles, Huntington Beach Pier was considered to have one of the world's most consistent breaks in the early days of surfing. The West Coast Surfing Championship was initiated there in 1959 and would be changed to the US Surfing Championship in 1964. It's been on surfing's world tour map ever since. Our Huntington wood surf style sunglasses pay homage to one of California's original surf spots. Glare Protection: Polaroid brand polarized lenses. The glasses are nice but I do wish they came with a case. The wood also feels a bit unfinished like it could use a once over with a super fine grit sandpaper. I like that they will float.